This entry was posted in Recommended and tagged Data management on April 3, 2019 by pmean. This entry was posted in Recommended and tagged Data management, R software on December 29, 2018 by pmean. This entry was posted in Recommended and tagged Data management on July 23, 2018 by pmean. Recommended: A crummy drop-down menu appeared to kill dozens of mothers in Texas. This entry was posted in Recommended and tagged Data management on April 19, 2018 by pmean. This xkcd cartoon by Scott Munro is open source, so I can hotlink the image directly. 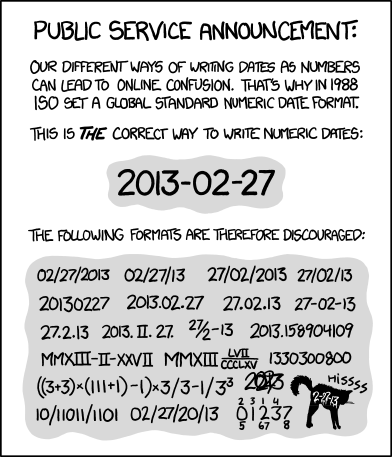 But if you go to the source, https://xkcd.com/1179/, be sure to hover over the image for a second punch line. This entry was posted in Recommended and tagged Data management on April 9, 2018 by pmean. This entry was posted in Recommended and tagged Data management on April 3, 2018 by pmean. This entry was posted in Recommended and tagged Data management on September 28, 2017 by pmean.